← The MTB lightest wheelset. When selecting new tires, rolling resistance is probably one of the most underestimated and often ignored factors of tire performance. Most of us simply assume that the narrower a tire is, the better it’ll roll. That’s basically as far as our attention on the subject extends, before we quickly move on and concentrate our thoughts on more common factors such as puncture resistance, durability, weight, and grip. In general terms, the total drag of a cyclist will consist of 80% tire rolling resistance and 20% wind resistance at 10 km/h or 6 mph. At 40 km/h or 25 mph the numbers will reverse, with total drag consisting of 80% wind resistance and 20% tire rolling resistance. A durable tire with a sturdy casing and a high level of puncture resistance, will not roll as well as a tire that’s very compliant, light, and more delicate of construction. A wider tire will roll better and have better grip compared to a very narrow tire, but will suffer at high speeds due to aerodynamic drag. The best rolling tubular tires also include Latex inner tubes, which reduces rolling resistance even further compared to a Butyl inner tube. Generally they aren’t present in tubular tires with high puncture resistance qualities, as the addition of an extra low rolling resistance inner tube will have almost no effect, unless the tire casing is extremely supple as well. The perfect tire with all variables are at their maximum. Too bad it doesn’t exist! Wide tires larger than 23 mm allow for good rolling performance and comfort at low inflation pressures. Adding a high puncture resistance layer to the tire construction slightly effects performance. The tire becomes a little less compliant, which results in lower rolling performance and comfort. Narrower tires of 23 mm and less, decrease rolling performance and require higher inflation pressures, which adversely effect riding comfort. Gains are made in aerodynamics requiring less energy for maintaining speeds exceeding 40 km/h or 25 mph. Again, by adding a high puncture resistance layer, rolling performance and tire compliancy is slightly decreased. A special case, as seen in tires with less supple tire casings, such as Tufo racing tires. Rolling resistance is very high at common running pressures of between 7 and 8.5 bar (~101 – ~123 psi). When pumped up very hard in excess of 9.5 bar (~140 psi), rolling perfomance will improve quite dramatically. Comfort on the other hand will decrease by the same extent. No optimal balance between pressure and rolling performance can be found for normal road riding conditions with these types of tires. They quite literally put you between a rock and a hard place. In order to match a tire to a given performance requirement, one has to take into account factors that are often mutually exclusive. Riding conditions and purpose (racing or training), have to be weighed against factors such as rolling resistance, comfort, reliability, grip, wear rate, and general cost of running. Only then can one arrive at an optimal compromise and claim to have chosen the most suitable tire. Testing was conducted at the Continental fascilities in Korbach – Germany. Protocol: The Coefficient of Rolling Resistance (Crr), was aquired by testing all tires on a 120 cm (47.244") drum at 30 km/h (18.64 mph). Loading was similated with a 44/56% balance of front and rear tire. Total bike including rider weight was 85 kg (187.39 lbs). 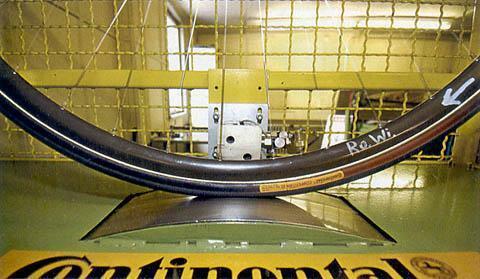 Click thumbnail to view tubular tire test results. Click thumbnail to view clincher tire test results. Cette entrée a été publiée dans Etudes. Vous pouvez la mettre en favoris avec ce permalien.